Deloraine. — A subscription is on foot in the township towards erecting a Wesleyan Chapel, for which we understood Mr. Bonney has in the handsomest manner offered to give a piece of ground. At present Divine Service is to be performed in Mr. Courtenay’s house, once a month, viz, on the Sunday when the Chaplain of Deloraine pays his accustomed visit to Port Sorell. On Sunday week last the Rev. 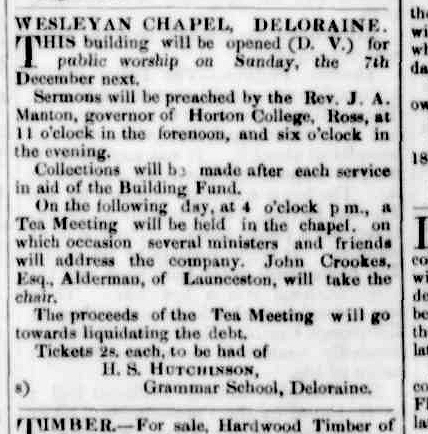 Mr. Waterhouse, of Westbury preached at Deloraine to a numerous congregation, and the Wesleyans in that district are likely to assume an important position; at all events the erection of a Chapel there will be the means of gathering in rather a large body of persons who from some cause or other object to frequent the Church. OPENING OF THE NEW WESLEYAN CHAPEL. On Sunday last, notwithstanding the unpropitious state of the weather, a good congregation assembled in this neat and pretty chapel to listen to two admirable discourses delivered by Rev. J. A. Manton, the President of the Wesleyan Conference and notwithstanding that very many friends of the cause were prevented attending, through the inclemency of tie weather, tile sum of £29 0s. 2d. was collected. At the Wesleyan Church, Deloraine, the Rev. E. T. Cox will preach two sermons on the occasion of the introduction of the new organ, on Sunday. Deloraine Wesleyan Church.– The Wesleyan Church, which, has been closed a short time for alterations and repairs, was reopened on Sunday. The Rev. W. Wykes delivered three excellent discourses to large congregations. The church which for ordinary occasions is quite large enough, was in the evening crowded. The subject in the morning was “The present political situation;” afternoon, “Flower service;” evening, “Law and Gospel.” Collections were taken after each service in aid of the church renovation fund. This entry was posted in Church: Methodist, Deloraine and tagged where is it? by Monissa Whiteley. Bookmark the permalink.